At Leather Paws we believe every dog requires a unique fit regardless of their breed. The weight measurement is not the best way to determine a perfect fit so we have to rely on proper measurement. We highly suggest you measure your pets neck where you want the collar to sit. We also recommend you leave approximately 0.25" to 0.5” breathing room for a comfortable fit. Once you have the exact or approximate size, utilize our Shop Collar By Neck Size tool to find the exact fit. How do we size our flat collars? 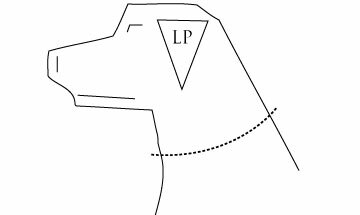 The illustration below will give you a basic idea of how we size Leather Paws flat/basic dog collars. The example is of a flat collar that fits 13" to 17" neck size with a 1" width. No worries! Contact us and we will guide you through the process.